I didn't really know what to think of this movie at first. It seemed slow, ponderous and lacked the grace and effortless choreography of the first movie- and it seemed to lack some of the production values as well. It was nice, however, to see the familiar face of Yu Shu Lien (Michelle Yeoh) emerge from her retirement in solitude to travel once more to Peking, where the Green Destiny, the sword of Li Mu Bai, her beloved resides in the house of Sir Te, who has recently died. The world has changed since the first movie: there's less honor, there's more chaos and the West Lotus clan has a Warlord, Hades Dai (Jason Scott Lee) who is looking for a blade strong enough to let him dominate the entire world. A young woman by the name of Snow Vase (Natasha Liu Bordizzo) arrives at his tower, attempting to join his ranks- as he approaches, she attempts to kill him, but is easily driven off. Meanwhile, a young man by the name of Wei Fang (Harry Shum, Jr.) is making his way through the forest when a blind enchantress (Eugenia Yuan) finds him and tells him to take her to Dai. Once there, she tells Dai to find the Green Destiny as it will allow him to dominate the world. Dai is reluctant to storm the house of the Emperor's brother, but the enchantress tells him to send Wei Fang and he does so. Realizing that Hades Dai will stop at nothing to retrieve the sword, Shu Lien asks for help from any remaining followers of 'the Iron Way' that are still out there- and happily, gets a response. Silent Wolf (Donnie Yen), Silver Dart Shi (JuJu Chan), Turtle Ma (Darryl Quon), Thunder Fist Chan (Woon Young Park) and Flying Blade (Chris Pang) show up to help guard the sword and, for awhile, they are successful- until Hades Dai, having learned that Wei Fang has failed, sends a raiding party to retrieve the sword. 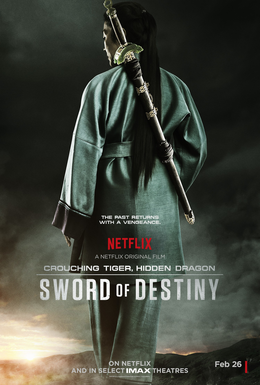 I was dubious about this movie at first... while it didn't seem like an unnecessary sequel, it also seemed like a sequel that no one was exactly clamoring for either and other than Michelle Yeoh being awesome as she ever is, the first twenty five minutes of this movie felt painfully slow. It didn't help matters that the close captioning was slightly out of whack with the actual dialogue either. Around the twenty five minute mark, however things took a turn- and by the time we meet Silent Wolf and his Warrior Posse, you find yourself drawn into the story and see the familiar touches that made the first movie so great emerge. Overall: A slow start doesn't doom this movie and while it's not the sequel I think a lot of people were looking for, it's a solid, respectable sequel that captures the grace and beauty of it's predecessor quite nicely. Donnie Yen turns in a sold performance as Silent Wolf, but it's Michelle Yeoh who owns this movie. She makes it worth watching. *** out of ****.